up to four connectable edges. In order to be added to a wire under construction, an edge (unless it is the first one) must satisfy the following condition: one of its vertices must be geometrically coincident with one of the vertices of the wire (provided that the highest tolerance factor is assigned to the two vertices). It could also be the same vertex. one vertex, identical to a vertex of the wire under construction; the other vertex not being geometrically coincident with another vertex of the wire. Constructs an empty wire framework, to which edges are added using the Add function. As soon as the wire contains one edge, it can return with the use of the function Wire. Warning The function Error will return BRepBuilderAPI_EmptyWire if it is called before at least one edge is added to the wire under construction. Make a Wire from an edge. Make a Wire from two edges. Make a Wire from three edges. Make a Wire from four edges. Constructs a wire. from four edges E1, E2, E3 and E4. Further edges can be added using the function Add. Given edges are added in a sequence. Each of them must be connectable to the wire under construction, and so must satisfy the following condition (unless it is the first edge of the wire): one of its vertices must be geometrically coincident with one of the vertices of the wire (provided that the highest tolerance factor is assigned to the two vertices). It could also be the same vertex. Warning If an edge is not connectable to the wire under construction it is not added. The function Error will return BRepBuilderAPI_DisconnectedWire, the function IsDone will return false and the function Wire will raise an error, until a new connectable edge is added. Make a Wire from a Wire. Usefull for adding later. Add an edge to a wire. Adds the edge E to the wire under construction. E must be connectable to the wire under construction, and, unless it is the first edge of the wire, must satisfy the following condition: one of its vertices must be geometrically coincident with one of the vertices of the wire (provided that the highest tolerance factor is assigned to the two vertices). It could also be the same vertex. Warning If E is not connectable to the wire under construction it is not added. 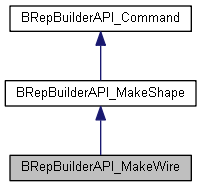 The function Error will return BRepBuilderAPI_DisconnectedWire, the function IsDone will return false and the function Wire will raise an error, until a new connectable edge is added. Add the edges of <W> to the current wire. Returns the last edge added to the wire under construction. Warning. A null edge is returned if there are no edges in the wire under construction, or if the last edge which you tried to add was not connectable..
another value of the BRepBuilderAPI_WireError enumeration indicating why the construction failed. the last edge which you tried to add was not connectable. Returns the last vertex of the last edge added to the wire under construction. Warning A null vertex is returned if there are no edges in the wire under construction, or if the last edge which you tried to add was not connectableR. Returns the constructed wire; or the part of the wire under construction already built. Exceptions StdFail_NotDone if a wire is not built.